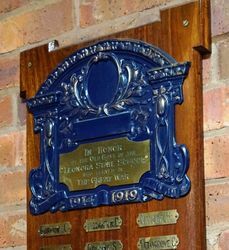 A wooden and brass honour roll commemorates ex-students of the Leonora State School who served in World War One. On Friday evening last, 21st inst, the Leonora State School was filled to overflowing — the occasion being the unveiling of the Honour Board. The ceremony was performed by the Rev C H Brooks, who spoke in glowing terms of those who went to the great war. Over 30 names appear on the Board, several of whom paid the supreme saoriflce, whilst others have returned and still living in the district. Leonora Miner (WA), 29 August 1925.